The Corolla as I bought it was a USDM (United States Domestic Market) car. 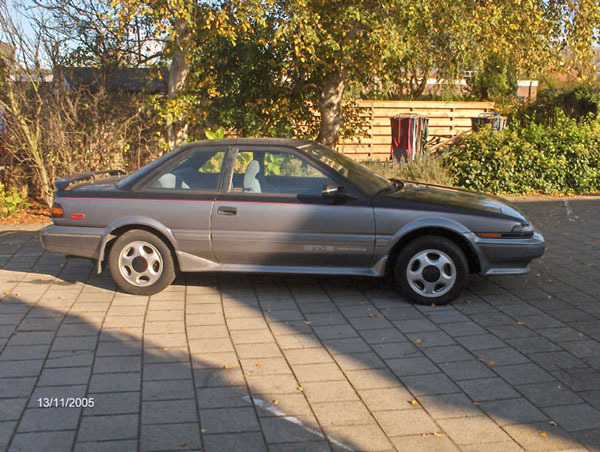 That meant that the car had to comply to US legislation if Toyota wanted to sell this model there as well. As US legislation differed from that of other markets where the coupé model was sold, they had to make some modifications to the car. One of those modifications involved the bumpers. US legislation stated that the front bumper should be able to absorb a crash of 5mph (About 8km/h) without damage occurring to the rest of the car. This was impossible with the ABS bumpers Toyota used on the car in other markets. So they altered the construction of the bumpers for the USDM cars. First they mounted a heavy beam to the chassis, with a layer of 'foam' in front of that to absorb impacts. 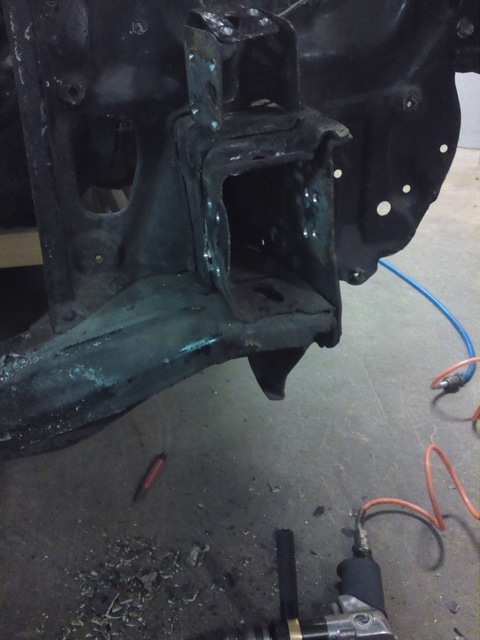 To make it look like a bumper again, this beam and foam were fitted with a 'cover' that was made of a very soft sort of plastic. This made the bumpers a lot bulkier and stick out a lot more than the Asian bumpers. If you ask me, this didn't do the looks of the car any good. 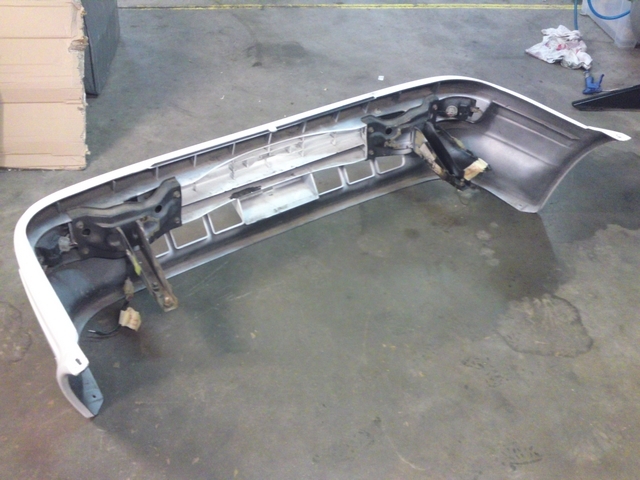 The heavy metal bumper beam of the USDM front bumper. Looking at the profile of the car, you can really see how the bumpers stick out front and rear. The bumper cover was made of a very soft kind of plastic that was very susceptible to deformations and had the tendency to sag a little here and there with age. Not very nice to look at and probably a nightmare for any painter to get the paint to stick to it without cracking etc. And on top of that, the JDM bumper look so much better than the USDM bumpers do. All in all a few very good reasons to ditch the USDM bumpers that came with the car and start looking for a JDM bumper. And then I had two bumpers I could choose from: The pre-facelift bumper (zenki) and the bumper of the facelifted car (kouki). Both are made of sturdy ABS plastic as was used on European cars. 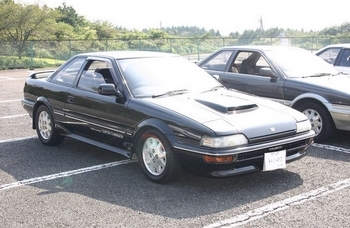 On the left the Sprinter Trueno zenki and on the right the Sprinter Trueno kouki. 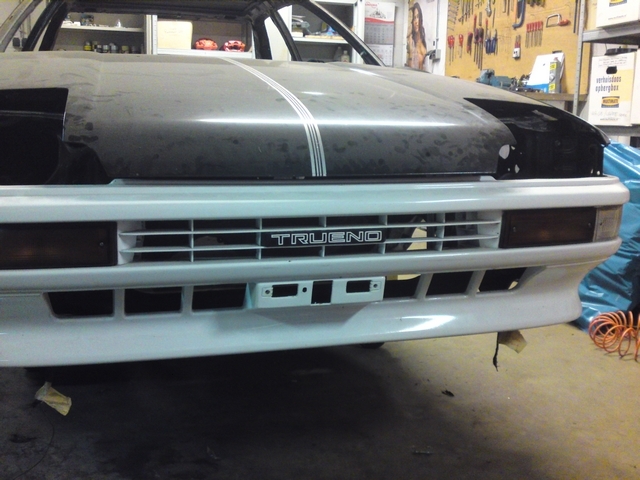 It didn't take me long to decide the Sprinter Trueno zenki bumper was the one I wanted on my car for the simple reason I liked that one the best. If I had opted for the Trueno kouki bumper I would have needed the bigger combo lights as well as they are different from the zenki lights. Finding a bumper alone was hard enough, finding one with the lights and all in good condition would have been a real challenge. The zenki uses the same lights as the USDM car so that saved me the added trouble of sourcing those lights too. 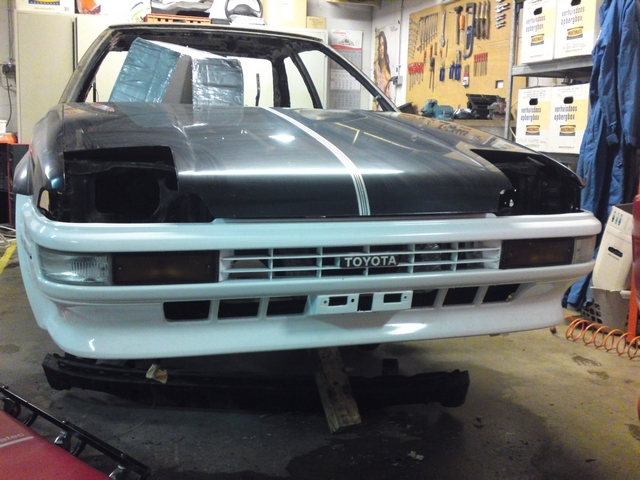 Oh well, I had to start looking for a Sprinter Trueno zenki front bumper then. My only problem with that: I'm not the only one liking that bumper. They are pretty rare by now and very much sought after. Most people that have one don't want to part with it just yet. Long story short: It took me over half a year with a pretty intensive search to track one down. I finally found one through a lead on the Club4AG forum. A guy in Canada had one for sale, so I shot him an E-mail. And apparently I was the first to contact him, because I got a reaction pretty fast with some pictures of the bumper attached. It was almost everything I was looking for in a bumper. It was clean, undamaged and complete. 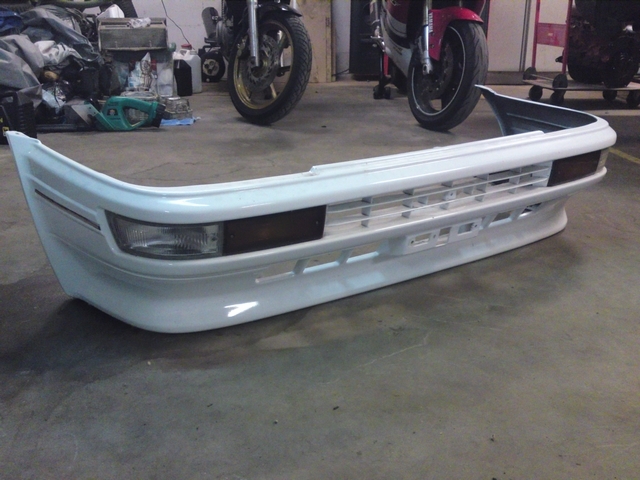 It would come with the mounting brackets and all the lighting that goes with this bumper. Which was a very good thing as sourcing those parts separately would be a absolute nightmare. Only thing missing was the 'Trueno' logo that goes in the grille. But that was no reason to let this bumper slip through my fingers. The guy selling it was very reasonable and we agreed on a very fair price for the bumper. Now came the next problem: The bumper was located on the other side of the globe. 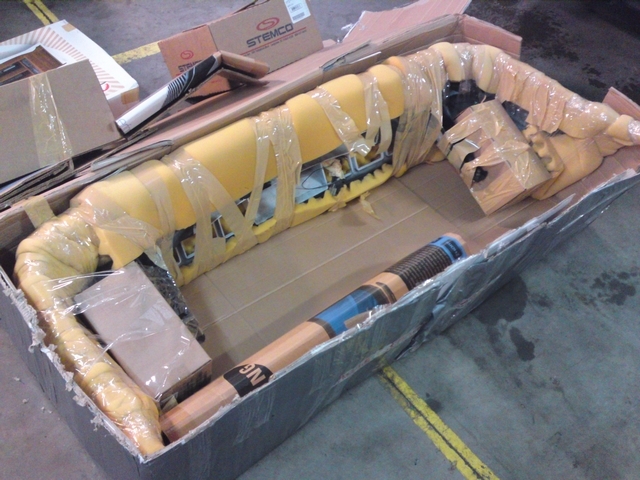 The seller was willing to ship it international, but we had to figure out how as it had to be economically feasible. 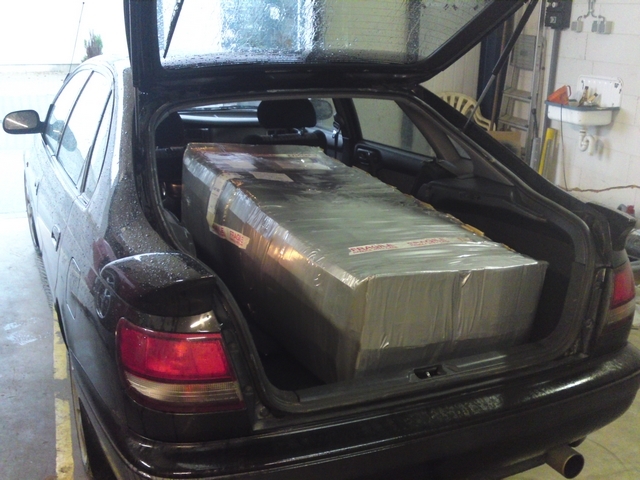 A plastic bumper doesn't weigh much, but it's a large item to ship and takes up a lot of space. The regular postage services don't take items that large. Shipping it in a container by sea would be cheaper then flying it in with and express services. But it's very difficult to find a shipping service that has some space left in their container coming to the right country. Al although the seller was very willing to help me out and did his part from his end, we just weren't able to ship it by sea. He was able to give me a shipping quote for flying it in but that was almost 3 times what I paid for the bumper itself. But now that I had a bumper that was almost impossible to find and which was in immaculate condition within my grasp, I just couldn't let it go. That bumper was going to be mine one way or the other! It was a real blow to my budget and a lot of people would think I'm clinically insane, but I decided to just bite to bullet and cough up the money to let the bumper be flown in. That speeded the process up considerably and not that much later I received a E-mail from a importing company that they had a package ready for pickup. I had to fill out some papers and then I could collect it at Schiphol airport Amsterdam. So I made a trip to Schiphol airport where I could take the bumper with me after I paid for some handling and import fees (Ohw why the hell not, it was already costing me and arm and a leg). 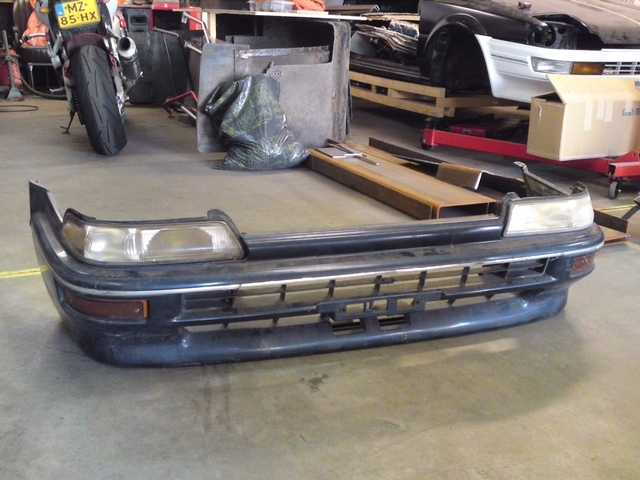 I think that after everything was said and done, I paid a whopping €1200,- for the bumper. But we have a saying here in The Netherlands: Better expensive than not for sale. When I got back home, I just couldn't wait to unpack my very expensive bumper. Apart from the missing 'Trueno' badge, the bumper was complete and in immaculate condition. Somebody really took care of it because there wasn't a scratch on it! The next job was obviously to see how the bumper would fit the car. But where I first thought it would be a simple bolt on job, that soon turned out not to be the case. I still had to take the front crossbeam from the USDM bumper off first. The bolts that held that beam in place had rusted in place and weren't budging. Not even with my impact wrench set to maximum force. 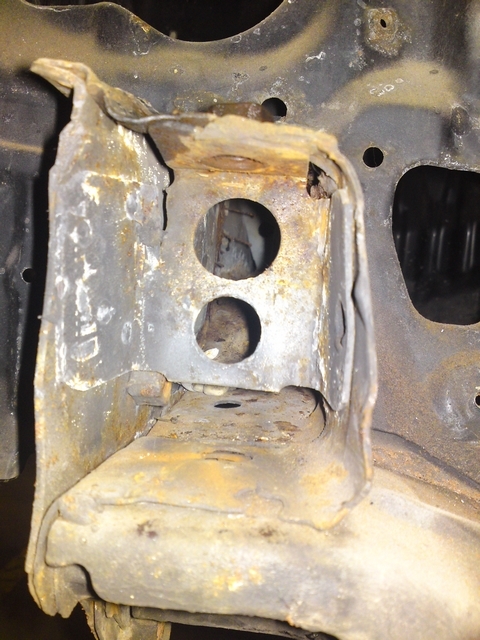 And one welded in nut, that the bolts thread into, had broken loose and wasn't budging either. 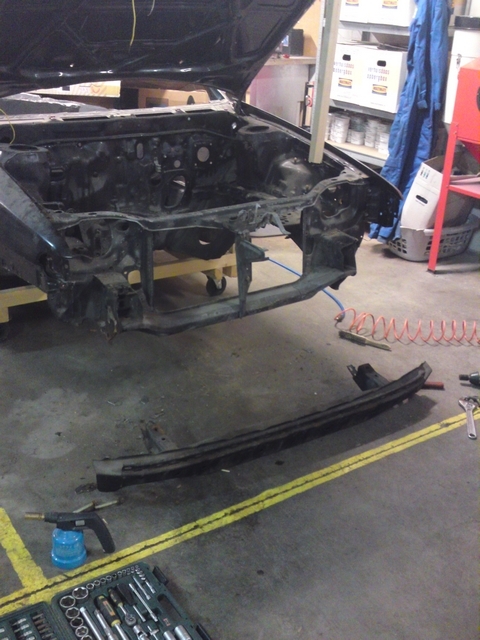 But used a few tricks of the trade to get them loose anyway and managed to get the bumper beam off eventually. 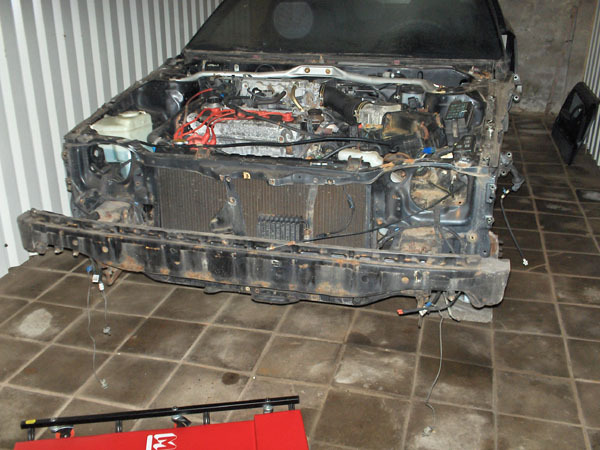 But now that I finally had that beam off, I found that there is a difference between the USDM front and the JDM front chassis. 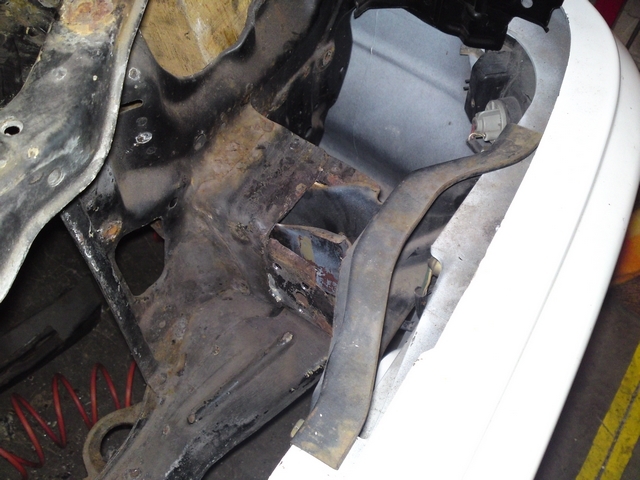 The chassis beams were obstructed with two plates that were welded in there. When I looked it up in my Repair manual for collision damage, it confirmed this. If I wanted to use the brackets that came with the JDM bumper, I would have to remove those plates. 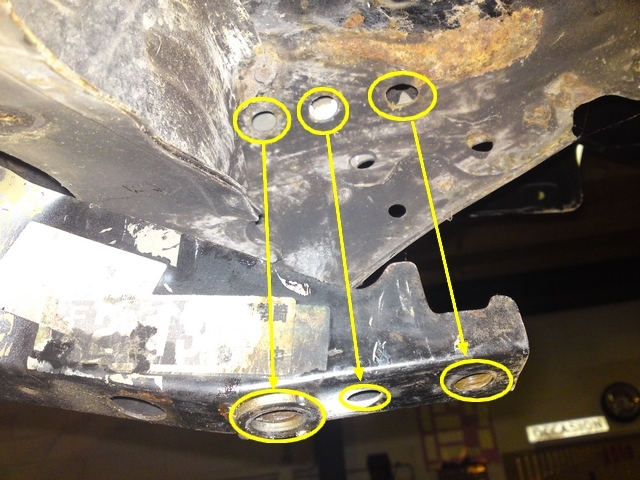 Other than that, the chassis of the USDM and JDM cars were the same, so the mounting holes for the JDM brackets were already there. That saved me the trouble of measuring it all out and drilling some good sized holes. And now the mounting brackets of the JDM bumper did fit. That allowed me to see the new front end of the car for the first time. 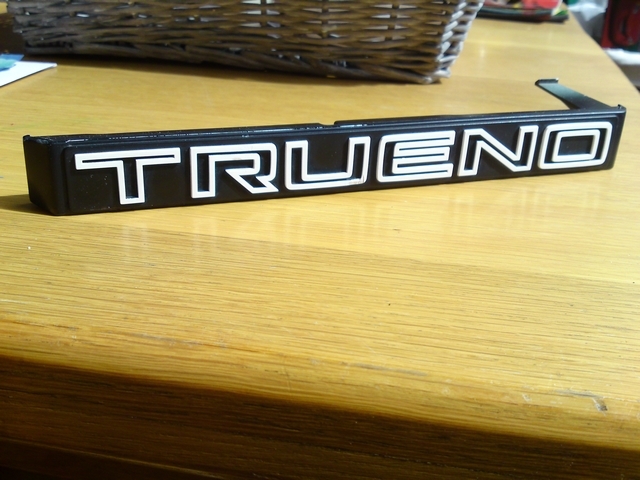 But that mounting place for the 'Trueno' logo in the bumper looked a little off. Sourcing that logo is going to be very difficult and I'm not sure if I will ever find the correct one. So I found a alternative. There is a little 'Toyota' logo in the grille that goes with the USDM bumper. 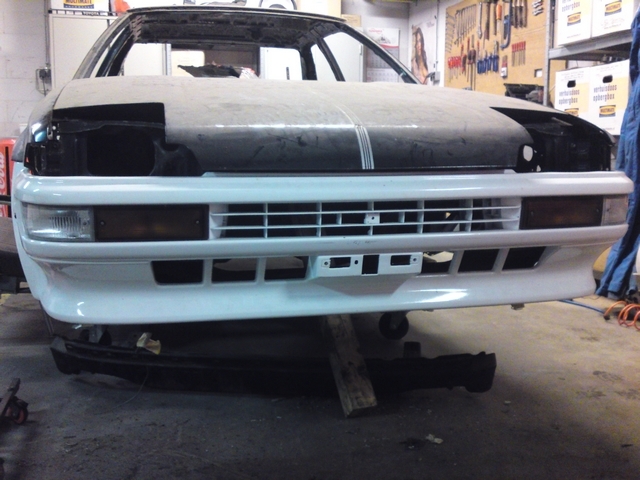 I wasn't going to use that grille anymore so I removed that logo to see how it would fit the Trueno zenki bumper. It was smaller than the 'Trueno' logo would be, but it did fit relatively well in there and didn't look all that bad. So at least I would have an acceptable alternative if I was unable to find a good 'Trueno' logo. But sometimes you just need a little luck on your side. A few months later, I received a E-mail form Canada, send by the guy who sold me the bumper. He knew I was looking for that 'Trueno' logo and had kept his eyes open for me. He was able to find and acquire one and gave me first shot in buying it off him. Since my own search had gone without any result thus far, I didn't have to think long on that offer. Shipping costs for such a small item were a whole lot better than that of the bumper, so a few days later, I had the Trueno logo delivered to my doorstep. 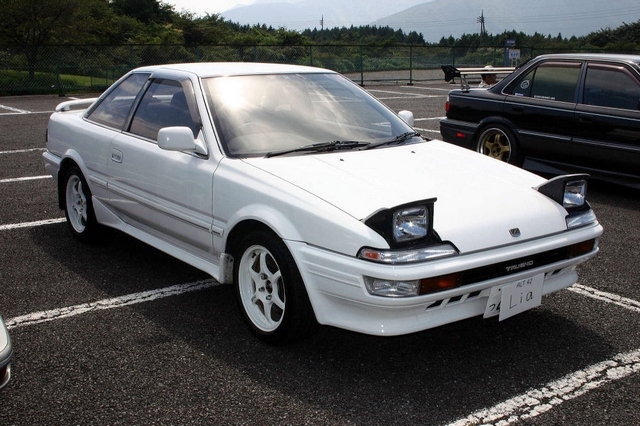 The Toyota logo in the bumper was nice, but this Trueno logo just belongs in there and looks much better. Now I have everything that belongs to the bumper complete and ready to be assembled when the time comes. A big improvement over that cumbersome USDM front bumper. I already mentioned that I had two bumpers to choose from to install on my car if I went with the JDM bumpers. The zenki and the kouki bumper. I went with the (I think) nicer zenki bumper. But by some shear luck, I stumbled upon a JDM kouki front bumper, complete with the combo lights that go with it which I was able to buy for a ridiculously low price along with a set of pop-up headlights and a hood. And all of that in my own country for crying out loud! I couldn't just leave it there so I took it with me, thinking that I might be able to sell it on and generate a little extra cash for the project. And although I had a lot of interest for that bumper from all over the world, most people stopped when they got a shipping quote from me (Hmmmm, sounds familiar doesn't it?). But eventually I sold it on for a nice profit and somebody from Poland collected it from me. So this bumper is now no longer in my possession.